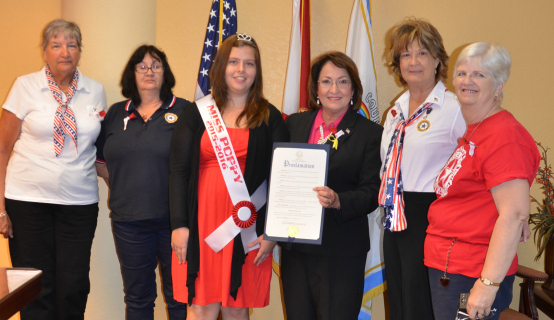 On Memorial Poppy Day, the women of American Legion Auxiliary (ALA) Unit 286 Pine Castle met with Orange County Mayor Teresa Jacobs and presented her with the First Poppy of the Year to honor and remember the courageous men and women of the Armed Forces who have made the ultimate sacrifice. Mayor Jacobs also presented the group with a proclamation recognizing May 21, 2015, as Memorial Poppy Day in tribute to the fallen heroes whose courageous spirit and noble sacrifice will never be forgotten. Since 1921, the red poppy has served as the nationally-recognized symbol of the selfless sacrifice of the brave men and women of who have lost their lives while protecting the freedoms of this great nation. The tradition traces back to World War I when the poppy was one of the only plants to grow on barren battlefields. More than 25 million red crepe paper poppies, made by disabled veterans, are distributed across the country under the supervision of the ALA’s estimated 125,000 volunteers. The poppies are handmade by veterans as part of their therapeutic rehabilitation in hospitals and poppy workrooms in 40 states. Donations received in exchange for the flowers go directly to assist disabled and hospitalized veterans in our communities. Founded in 1919, the ALA is the world’s largest women’s patriotic service organization with nearly one million members and 10,500 units in all 50 states and foreign countries. Members are veterans or direct relatives of veterans. The Pine Castle unit has 267 auxiliary members and distributes poppies annually on Memorial Day and Veterans Day. A collection of photos from the Memorial Poppy Day Proclamation Ceremony are available on Flickr for use by the media.